Redecorating doesn't have to be about big sweeping changes. Just attend to a few small details in your decor and you can create a room that says "wow". Whether you purchase some accent mirrors, lamps & pillow shams or decide to refurbish your own, redecorating is easy when you focus on the small details. Here are some simple suggestions for creating a spring haven in your home. (ARA) - It's that time of year again when you might feel the urge to purge - otherwise known as spring cleaning. But think twice before trading in some of your home decor items - instead, trade them up. By adding small details to what you already have, you can achieve a chic and rejuvenated look for spring. Before relinquishing boxes of trinkets, "clutter-creators" and damaged accessories, consider repurposing items such as plain lamps and window treatments, tattered pillows and throws, or unused vases and china. Small details help create a spring haven with a fresh perspective and affordable materials such as decorative trim, mirrors and faux-flowers. While taking inventory of the items you have to work with, begin visualizing your ideal decor. Need inspiration? Peruse the pages of your favorite magazines. Whether replicating a designer pillow for the family room or fashioning an outdated lamp in the guest room into something trendier, upgrading existing pieces will breathe new life into the room for the season. Is the couch in perfect condition, but the pillows have seen better days? 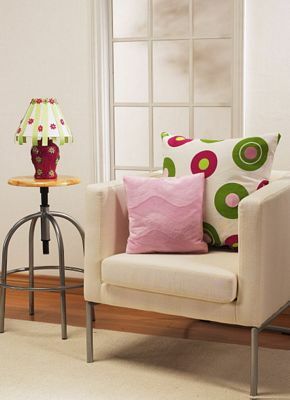 Redress your favorite furniture by using the tattered pillows as an insert for no-sew pillow shams. In just a few hours and with a little bit of creativity, you can achieve a glitzy designer look. First, find a fabric with spring-infused hues and patterns that compliment the room. Measure the pillow and cut the fabric to the appropriate size. Take one piece of fabric with the pattern facing up, and run a small bead of Perfect Glue 1 adhesive along three sides. Next, place the other piece of fabric on top with right sides together and press firmly. Steam iron the three adhered sides to speed the curing process. Allow one hour for drying and then turn the sham right-side out. Insert the pillow into the sham, and glue the final hem. Use clothes pins to hold in place until dry. Continue your spring haven mission by creating an airy environment with accent mirrors in order to open up and visually extend spaces. Use mismatched pieces of china from your "junk" pile as frames for wall mirrors. For larger mirrors, chargers work great! Simply choose a circular mirror that fits into the center of the plate and adhere using strong craft glue, such as Perfect Glue 1. Apply a heavy object on top of the mirror and allow two hours for drying time. Lighten up your space figuratively, as well as aesthetically. That dated, albeit trusty lamp may be the perfect candidate for a makeover to better reflect your rejuvenated decor. Consider covering the offending lamp base with unique embellishments such as rope or artificial greenery. A versatile adhesive (such as Perfect Glue 1) will adhere to a variety of surfaces such as ceramic, metal, stone, and brass. Don't forget the lamp shade! Extend your creativity to design an eye-catching and complimentary shade to complete the lamp transformation. Now that your imagination is blossoming, don't stop. Move on to the next space and continue to refresh your household items. And, remember - it's all in the details. For more detailed information on how to create the projects listed in this article, visit www.perfectglue.com.